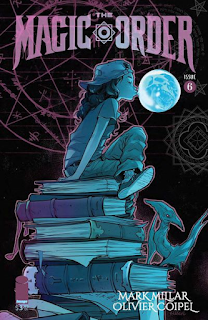 I have been anxiously awaiting the final issue of Magic Order, and now it's here! If you don't like cliffhangers, this might not be a series for you. Every issue leaves you wanting more (and they're really, really dark). There's always a big surprise or twist at the end, and then you have to wait another month to find out what happens. Thankfully, this is the last one! Everything should be resolved by the end. 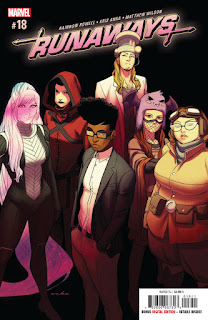 This issue of Runaways should conclude the current arc, and I'm curious what Rowell will do next! The characters in this series have grown so much over the last year, and I've enjoyed watching them come together to fight their past and present issues. It's always a fun comic to pick up! this thrilling tale filled with magic and set in the mysterious Carpathian Mountains where a girl must hunt down Vlad the Impaler’s cursed ring in order to save her father. This is not my typical kind of read, but it's Jenn Bennett. I have enjoyed her paranormal historical series, so I will definitely give this a try. 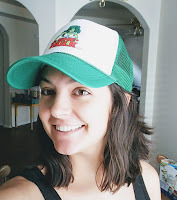 My first Jenn Bennett book was Bitter Spirits, so I started with her supernatural stuff. ;) It was an amazing start to a series, and one I know I'll read again. I've also enjoyed all of her YA books that I've read, and I'm really looking forward to this one. It has such a unique and interesting premise! <3 I hope we both love it. I tried to watch the Netflix version of Marvel's Runaways, but I couldn't get into it. It's on Netflix? I thought it was Hulu! I've heard it's okay, but haven't had a chance to watch it for myself. I'm sorry it didn't work for you! The comic series is really great. Have you read any of Rainbow Rowell's books? I'm currently reading Fangirl at the moment, but I haven't before! I've only heard good things about her writing though! I haven't read that one, so you'll have to let me know how it is! I've only read Eleanor & Park, and The Runaways comic! The fact that this is from Jenn Bennett and takes place in the Carpathian Mountains has me sold! 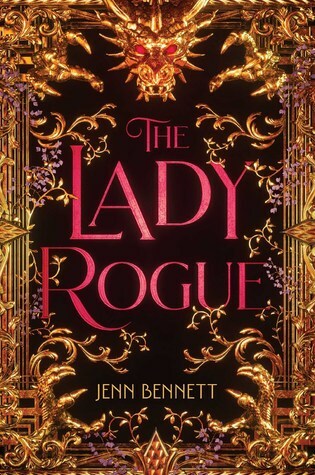 Ooh, The Lady Rogue sounds pretty epic! I'm really curious about Magic Order and The Runaways, so I need to find those! Well, hello Bennett. I have read a few of her romances and really enjoyed them, but YA contemps aren't really my thing..so this, this excites me! Yay! I hope we both love The Lady Rogue, Kimberly! I've enjoyed her adult books as well as her YA, but I'm really, really excited for this one. It sounds fabulous! 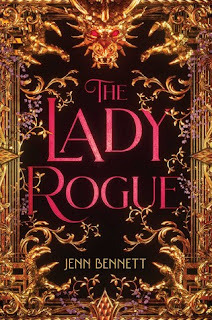 I've never read anything by Jenn Bennett (she does a lot of YA contemporary, right?) But I am living for the summary of Lady Rogue. Runaways!! Woot! I just finished the second season on Hulu a while back and it got me wanting to read these again. I think I left off with Vol 6 of the original series. Is Old Lace still around? Is the series still worth watching? I'm on the fence! If I do decide to watch it, I have to "try" Hulu for a month or so and then cancel my subscription, haha. Old Lace is still around, though I'm not sure what her origin story is, or how she became a part of the group. Didn't Gert's family gift Lace to her or something? Like an alarm, or an attack dinosaur? I can't remember now. I think so- I know on the show that's the case w/ Gert's parents (although she more finds Old LAce than them giving it to her) but in the comics I don't remember? It's been a couple years since I read 'em. And the series is okay. Like the first season took a little criticism for being called Runaways but they never actually run away til the end haha. S2 is more about them actually "running away." I also liked S2 more. It felt more like the comics. But S1 is setting up the world and has its moments. It's a tough call as to whether it's worth the Hulu crap. I liked it okay but it's not ESSENTIAL viewing, IMO? Noted! Jacob mentioned Hulu was getting a lot of Marvel shows (or they already have?). I think he mentioned Modok and Tygra, which would be interesting. I'm curious if they're shows made by Hulu, or if it's just the platform being used. You'll have to let me know! I might see if it's possible to rent Runaways somewhere, because it doesn't sound like a show I'd want to sit down and watch all day. If I'm going to spend time watching something, I want it to be good. Especially since that means it's taking time away from something else. I know what you mean. It's hard to say with Hulu- I heard that MAYBE some of the Netflix shows might go to Hulu. I hope so. MODOK and Tygra definitely sound interesting- are they going to be animated? Seems like I heard that somewhere. And yeah Runaways... *sigh* it's so hard to say. I mean I liked it, but enough to recommend it? I just don't know lol. Renting sounds like a good option if available! I have no idea! If they're not animated, the costumes and CGI will be insane. Hmm -- you lac of enthusiasm makes me want to avoid Hulu, haha. I'll see if it's possible to rent the series. I'm sure you can buy it somewhere, and if that's true, renting should also be possible.